Eberhard Schmidt-Aßmann was at IILJ as a Senior Visiting Scholar from April-May of 2014. 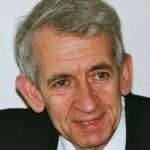 Professor Schmidt-Aßmann was a Founding director of the Institute of German and European Administrative Law at the University of Heidelberg, until retirement in 2006. He continues to participate in research and teaching activities as Professor Emeritus. Most recently, Professor Schmidt-Aßmann has been the Head of the interdisciplinary Protestant Research Institute in Heidelberg (FEST).